This slide brings tears to my eyes. I think it’s because when I decided to move to Hong Kong in 1990, I thought this would be a normal scene. The sea, the mountains, the beautiful skyline, and of course the exotic sampan. But when I arrived, the tallest building in this photo (Connaught Centre aka Jardine House aka the House of a Thousand Arseholes) dwarfed in comparison to the newer, glossier skyscrapers that had popped up since my grandparents took this photo in 1974. My biggest shock, however, had to do with sampans. Where in the world were they? Weren’t they the symbol of Hong Kong? The government tourist agency used the sampan as its logo, after all. Sadly, I quickly learned they were basically a thing of the past. Or a tourist trap that would cost my whole year’s living expenses. So I never sailed in one of these beauties. And even if I’d had the chance, I’d probably have been too embarrassed. I wasn’t going to be a tourist in Hong Kong! Back in 1974, the Cross-Harbour Tunnel had only been open for two years. 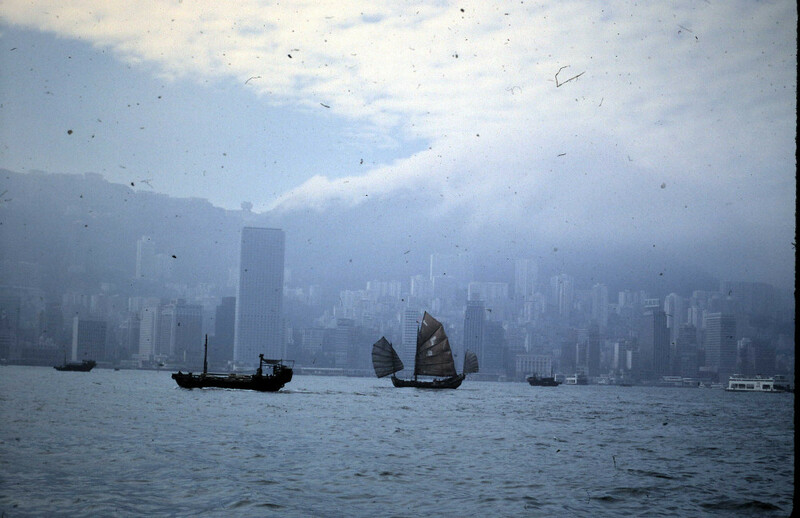 Before that and before the MTR (subway) was built, if you wanted to cross the harbor, you could board the Star Ferry or take a small wallah-wallah. Sampans brought tourists out to the floating restaurants in Aberdeen and one in Shatin. I once heard a lecture in college about the impending handover. 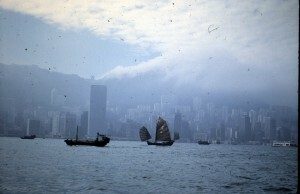 The speaker insisted that Margaret Thatcher had at one point, during negotiations with Beijing, suggested returning Kowloon and the New Territories to China in 1997. The UK would keep Hong Kong Island. As crazy as that sounds now (and then! ), it’s a good thing people had more transportation options in the 1980s than they did a few years before my grandparents snapped this photo–in case Maggie had had her way.